← Maple Field Milk – What Help Can the Government Give? The price of Easter eggs sold in supermarkets has been slashed this year, but rather than prop up this dying mode of purchasing food how about making this an opportunity to learn more about how real chocolate is produced? There has been a real growth in understanding about the difference between quality chocolate and mass-produced poseurs. Whilst the cocoa beans themselves only grow within a narrow band around the equator, most are actually processed nearer to where they are eaten, often in Europe. An even larger number of people are choosing to specialise in making chocolate confectionery (as opposed to the chocolate in bar form) so that it is one of the foods of which we in Britain can be proud. This is a giant leap forward if we remember that for a quarter of a decade we wrangled with the European Union over whether the typical milk chocolate produced in Britain could even be called chocolate at all or should be renamed “Vegelate” owing to the high proportion of vegetable fats it contained. In the year 2000 a compromise was struck enabling us to continue using the name but with the proviso that if the product was to be exported it had to be described as “family milk chocolate”. Perhaps the EU did us a favour in this instance, because it certainly helped raise awareness of what goes into a bar of chocolate and now, with the rise in quality British-produced chocolate, learning about the process, from bean to bar, is far easier than it used to be and a tasting box or other learning experience would make a very enjoyable Easter present. Here is a brief introduction to the subject to whet your appetite. Taste is, of course, subjective, and those of us brought up on Cadbury’s, with all its vegetable fat, are likely to still have a soft spot for this type of chocolate with its comforting childhood memories. However, we have probably learnt that we ought to like chocolate with a higher cocoa solid content and certainly most of us are trying to cut down on our sugar consumption, which is usually in inverse proportion to the cocoa solids. Hence the British Milk Chocolate we are used to normally has no more than 20% cocoa solids and 80% sugar, whilst a dark chocolate will be likely to have 70% cocoa solids and 30% sugar. The cocoa solids do confer most of the health benefits that chocolate offers, but let’s face it, we are not really eating it for the health benefits are we? 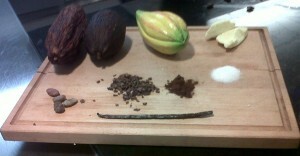 From a taste point of view the type of cocoa bean and where it is grown will have most bearing on the flavour. Criollo cocoa beans are the best, but are difficult to grow and rare, making up only 5% of total world production, 80% comes from a variety of the high yielding Forestero bean. The remaining 15% comes from a hybrid between the two, called Trinitario, which is easier to grow than Criollo but more fruity and aromatic than Forestero. Criollo is rarely used on its own, but its inclusion will enhance flavour and the use of this or Trinitario may make a more flavoursome chocolate even at 50% cocoa solids than a 70% Forestero. It is also easier to retrain your palate away from wanting large amounts of sugar if it is done in smaller steps, so begin by increasing your cocoa solids and focusing on the type of bean used. It is also important to understand why cocoa butter is much better than vegetable fat. It is not just from a health point of view, although it is true that cocoa butter is generally considered a good fat whilst solidified vegetable fats (trans-fats) are definitely in the bad camp. One of the most magical things about cocoa butter is that its melting point is only fractionally above blood temperature, so that at 33˚C it is crystalline and solid but at 34˚C it melts, allowing the flavour to flood out over the tongue. The initial substitution of vegetable fat for cocoa butter was carried out by the American company Hershey, to enable chocolate to be more readily transported as part of the troops’ rations. Additional pressure to do so comes from the fact that there is intense competition for cocoa butter from the beauty industry, which will often pay more than is paid by the confectionery industries. But this melting point is critical to the taste sensation of good chocolate. The fineness of the cocoa solids (through a process known as conching) also adds to the taste experience, whilst where the beans were grown will influence the nuances of flavour in exactly the same way that the same grape variety will taste different when produced in different parts of the world, but let’s concentrate first on checking the basis ingredients. Having just mentioned cocoa butter, let’s start by saying that the fat most frequently used as a substitute is palm oil, demand for which has been responsible for the destruction of huge swathes of rainforest. Then there is the issue of pay. Cocoa beans have to be harvested by hand; a very labour intensive process that is frequently low paid and often involves child labour. Fair Trade outlaws the use of child labour and pays a fair price, for more mass produced chocolate it is a worthy label to support, but it operates only in the poorest areas. With the exception of the Ivory Coast, small farmers account for the majority of cocoa growing and the long term investment required, problematic in itself, is compounded by fluctuating returns. Cocoa beans are usually purchased after they have been fermented and dried, and then the more capital intensive part of chocolate production takes place elsewhere. Few European producers involve themselves in the labour intensive early stages and yet, according to Hotel Chocolat, one of the few to do so, at least 70% of the flavour has been locked into the beans by the end of the fermenting and drying process. They purchase the beans “wet”, guaranteeing to purchase the entire crop of each of the 167 farms they have signed up. This enables the farmers to reinvest and ensures a higher quality cocoa. Whilst there are few producers involved in the whole process this way, high quality chocolate often comes from single estates where some interest in the farming and living standards comes into play. Another ethical consideration is the use of pesticides, the most lethal of which has recently been banned but which is still an area of concern and potentially harmful to those working on the plantations. The best practice is to grow cocoa in conjunction with another crop, such as bananas, so that the even higher trees provide shade, protecting the crop from disease and requiring less irrigation. Listed below are some on-line sources of single origin chocolate bars that will enable you to discover more about the differences that climate and soil can make to the flavour. For example the Caribbean is generally expected to produce chocolate that is earthy, slightly spicy, and with hints of tobacco. Central America and Indonesia produce cocoa beans with more acidity and a flavour reminiscent of red berry fruits, whilst those of South America are more floral. Sound – when you break it there should be s distinct “snap”, which indicates that it has been tempered correctly. You will then also be able to see the texture of the broken bar, which should be distinct, like tree bark. Now Smell the chocolate, it should obviously smell fresh, but you should also be able to pick up specific aromas such as those mentioned above. 4. When you hold a square in your hand you should Feel it should begin to melt within seconds, indicating the use of cocoa butter rather than other fats. 5. At last you get to Taste – let the chocolate melt over your tongue and try to identify the flavours. Chocolate Trading Co – A wide range of bars from quality producers around the world. William Curley – Five time voted “Britain’s Best Chocolatier” see recipes for an account of making truffles with them.